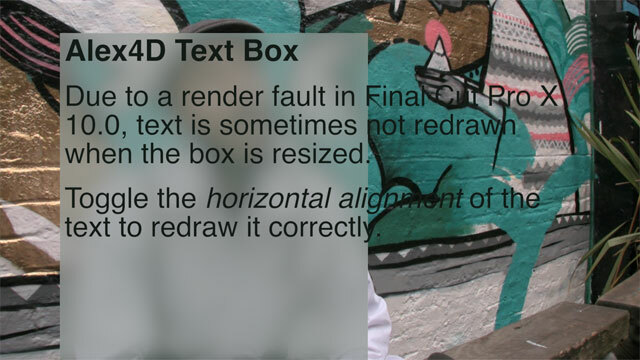 Here’s my next Final Cut Pro X effect: a title generator of a resizable text box with various fill options. Although you can keyframe all the parameters in Final Cut Pro X, the co-ordinates will not animate correctly, this is due to bugs/design decisions in the current versions of Final Cut and Motion. Download the effect archive from here. I’ve updated the effect to work with version 10.0.3, an update that changed the way title generators worked. I’ve added a new Opacity parameter which you can keyframe (or fade in and out using the video animation graph). For more information on what’s changed, visit my blog post on the subject. If you haven’t updated to 10.0.3, this effect will show a blue screen and/or cause Final Cut Pro X 10.0, 10.0.1 and 10.0.2 to crash. The 10.0.3 update works fine and is available for free from the Mac App Store. If you don’t want to upgrade download the old version. As the Final Cut Pro X and Motion 5 combination is relatively new, there are still a few bugs you will need to work around. When you resize the text box so the right-hand edge changes Final Cut doesn’t get sent the message. That means it doesn’t redraw the text to reflect the new boundaries. Thanks for the title. I used it in FCP 7 and now I just installed in FCP X.
I just created a new Webinar for FCPX users to get started. don’t know if it’s me but I’m having a hard time animating the opacity of the actual text. Box works fine but text is either on or off. Please tell me I’m not going mad! All your stuff is top. Is it possible to add the transitions to this text box? If i do, it looses the most of the effects like shadow, background blur, etc. Final Cut crashes on every attempt to apply the effect to my clip. Any ideas why this is happening? Do you have the Helvetica font installed? If not, that might be a problem. If Helvetica is installed, try using the Font Book application to Validate all the fonts you have enabled on your computer. Thanks for replying so fast. I do have the Helvetica font installed. The Font Book app returned 470 fonts passes and 41 minor problems. Of the minor problems Helvetica as not included. Arrgh, I would love to use this effect. Do you have any other suggestion? If it helps, when I scrub the effect in the effect window it turns blue. I can add the effect to the timeline, but as soon as I click to edit, the program crashes. I’m having trouble use the effects and/ or plug-ins all i’m getting is the blue screen any words of advice? Josh, did you get it to work? I’m running 10.0.1 I can use the sparkle effect but not of the other ones. Okay, thanks. I updated to the latest version and everything works okay now. I’m having a hard time with this box, I install it the correct way and when I’m trying to use it in FCPX I see a blue screen, and if I select it, it closes the FNCPX automatically, please help me!! I’ve updated the effect to work with version 10.0.3 (the previous version didn’t work properly in the newer version of FCP X), which is a free upgrade from the Mac App Store. I love your text box effect, it’s the most flexible one I’ve used to date. I’m having one technical issue and can’t figure out why – I have 3 text boxes with transitions between them as part of a compound clip. 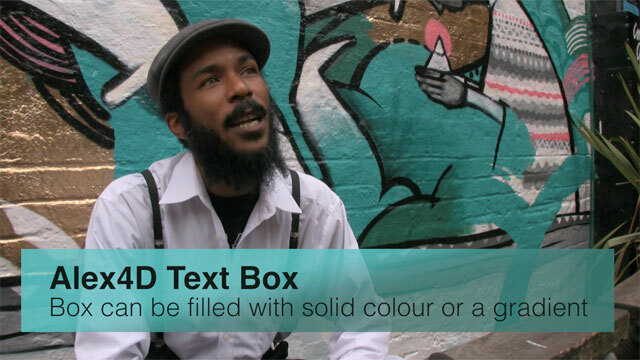 I centred the text vertically and horizontally in all 3 clips inside the box. However it seems when I close FCPX and re-open it – the alignment reverts to its defaults and I have to keep manually fixing it. Not sure what I’m doing wrong – any advice? It’s due to a bug in Final Cut Pro X. Some people have found that choosing ‘Revert to Original Layout’ from the Window menu before you quit can prevent Final Cut Pro losing the information. 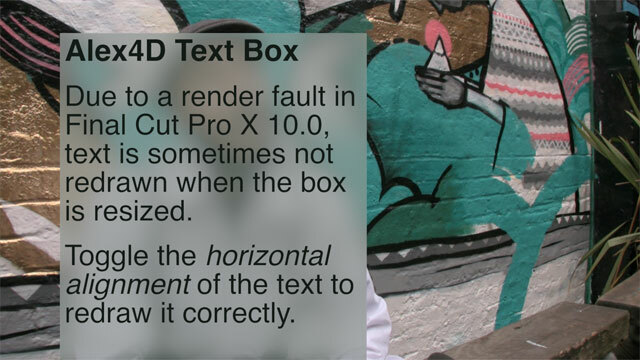 Alternatively, when after making your text and layout changes, you could also try clicking a different panel in the inspector (such as Video or Text) before deselecting the clip. Sadly it’s a matter of helping Final Cut Pro’s database for the project keep up with what Final Cut displays, because it is obvious that that when you go back to the project Final Cut reads the database but doesn’t find any parameter changes for some of the titles away from the default settings. If you find a method that works for you, please come back here and reply to this thread. 10.0.3. changed the way title generators worked, so I added a new parameter which you can keyframe (or fade in and out using the video animation graph). For more information on what’s changed, visit my blog post on the subject. No matter what I do, I can’t get it to come up in my titles. Love this Alex and It’s even possible to animated the way I want !!! Bravo et merci ! I’ve followed all of your steps and now the zip file I downloaded from your website is in my Alex4D folder. Where do I find it in Final Cut Pro X now? Thanks for taking the time to answer this! I’ve just discovered your website and am AMAZED at the resources you offer! I will DEFINITELY be donating in the near future! Go to the Titles browser, and click Alex4D. Thanks Alex! Unfortunately I don’t see see Alex4D there. I’ve searched “Alex” and “4d” alone. and put the folder ‘Alex4D Text Box’ into the ‘Alex4D’ folder. How do i download this plugin? I don’t see anything to download. Please discard the problem I had with cross-transition and the text box. I found the answer on one of your pages (video-animation + opacity). This is a godsend. I’m shocked at how few options there are for this sort of simple title formatting in FCPX. Thank You!!! Wow! Thank you a lot Alex!